The line was originally built by the Stockton & Darlington Railway in 1847 to transport limestone to the ironworks of Teesside, and by 1895 had been extended to its final terminus of Wearhead. Although the passenger service was withdrawn in 1953 the line was used until 1993 by the Blue Circle Cement Works at Eastgate. Thanks to the sheer determination and hard work of enthusiasts the line now runs between Stanhope and Bishop Auckland with the station at Frosterley just 39 steps from the Black Bull. 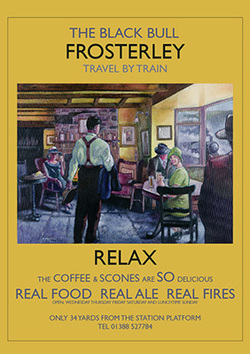 The connections to Darlington make travelling to the Black Bull at Frosterley convenient from anywhere on the rail network but check the timetable on the Weardale Railway website. Weardale Railway's own steam engine is a nostalgic sight threading its way up and down the dale criss crossing the river Wear. The "War on the Line" weekend in July is a chance to dress up and enjoy the music and fashions of the 1940's. Current timetables can be found on the Weardale Railway website along with the latest news and events on the Weardale Railway.